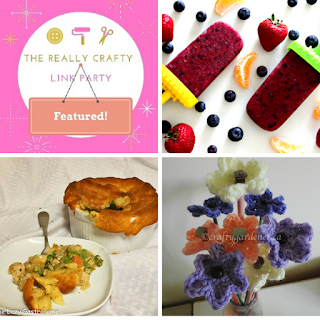 Welcome to The Really Crafty Link Party #130! Hello, and welcome! I hope you've all had a lovely weekend and I'm so glad you could join us for The Really Crafty Link Party #130! This is going to be the last party of July, which means that August is right around the corner. And August is vacation month for me. I will only be on vacation on the last two weeks of August but still...yay! Now, onto this week's party: come and share all your posts, try to visit at least a couple of other links and spread the word on social media - the more, the merrier. The linkup will be open until next Thursday and I will be posting the features on Friday, August 3rd. Vacation time is always an exciting one. We are going on a cruise in September. On count down here. We've been meaning to go on a cruise since forever and somehow always end up with other plans...maybe next year. But yes, I'm already counting the days to start our vacation time! Thanks for hosting a great link party. Definitely will pin. Thank you for joining Barbara. Old posts work just as well, and I loved your napkins & matching table cover ideas. Thanks for hosting a great party. And thank you so much for featuring my chicken pot pie - I'm honored! Have a great rest of the week!